Alexa.com is one of the big players in the search engine business that has been around since 1996. Although it isn’t as large as Google.com or Bing.com, it plays a unique and important role. Alexa is a subsidiary of Amazon.com, and so in my opinion it is likely to continue to grow in stature along with Amazon. As well, it has close ties to both Google and the Open Directory Project, which are both prominent players in the search world. So bottom line here is that getting your site into Alexa and having it properly catalogued is pretty important. But the process of claiming your site in Alexa is not easy if you are trying to claim a WordPress.com site. There is a lot of mis-information out there as well as incompletely written instructions (including on the Alexa FAQ site itself). I found this out the hard way today. In order to save everyone some time I am putting together this article on how I successfully registered my WordPress.com hosted blog with Alexa. Step #1: was to create an account with Alexa. This is fairly straightforward, just follow the instructions the site gives. Step #2: Once you have your Alexa login and you are logged into your new account, click on the second toolbar tab on the top of the site titled ‘Claim Your Site’ . Step #4: Now comes the tricky part. You are given two options. The first is to upload a file, which cannot be done with a WordPress.com blog. You must use the second option, which is to add a code to a meta tag in your blog’s header. This is difficult because WordPress.com does not cleanly support this. Below is a screen capture of the Alexa verification page, followed by the steps you must follow. Log into your WordPress.com Blog. There are three Text boxes in which to enter codes on this page. Only the Google Textbox works for this verification. The Yahoo or Bing verification boxes will not work with the Alexa verification process. Click the “Continue” button to finish your site registration. I hope these instructions were clear and helpful to you. As with anything I’m sure the verification process will change over time. It’s likely that either Alexa or WordPress will simplify things since the current way of properly registering a site is quite finicky and must frustrate most people who try. 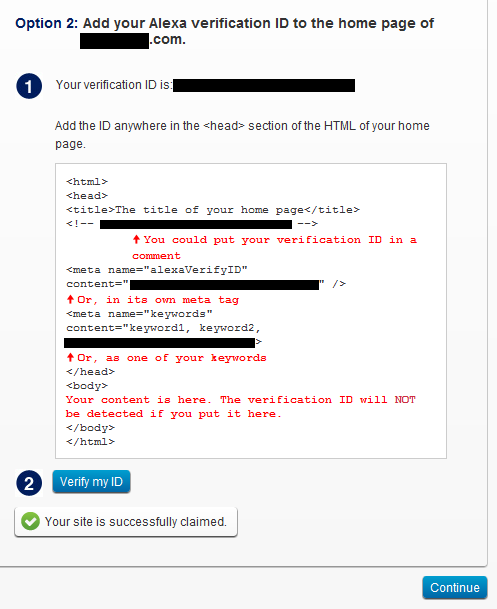 The catch in my case was entering their verification code into the correct WordPress text box. Since Yahoo has just moved its Webmaster tools to Bing, I naturally used the Yahoo verification box and was surprised when this didn’t work. It was only after a bit of trial and error that I discovered that one needs to paste the code into the Google text area for the verification process to work. I really appreciate the sharing of knowledge which you had to find out the hard way. By the way, what type of account do you have on wordpress.com? I am thinking to move my blog to my own domain. Hi, glad you found the post interesting! Actually I don’t want to move to self-hosted. I only want to use my own domain as you do. Ah, ok I see. I registered my domain directly through wordpress so they took care of the details for me. On a wordpress.com account the domain management options are directly under the sidebar “settings” and then “domains” option. You may find the wordpress faq on the topic helpful, it is located at: http://en.support.wordpress.com/domain-mapping/ . I basically just registered my domain with wordpress and when they had set it up, I set my new domain as my primary domain. I hope this helps! Thanks for the how to, definitely was easy to setup. I just found out about alexa a couple weeks ago, I heard the guy who started that site was one of the creators of the web. Hi John, I’m glad the article was helpful and you were able to register with Alexa. The engine definitely has a long history on the web as one of the originals, and still holds a lot of clout. Justin, if you have already setup up Google what do you do? Can I put the Alexa number in just to verify and the replace the Google info? Yes, that’s what I ended up doing. After I finished registering my blog with Google I pasted the Alexa number into where the Google number was in WordPress. This allowed me to complete the Alexa registration process, and my Google registration remained unaffected. Justin, thank you for your quick response. I was happy to see the answer here….. One thing I am confused about though. Is it best to leave the Alexa registration number in or to put back the Google registration number? I don’t think it really matters if you leave the Alexa registration number or put back the Google registration number. When I registered my site I replaced my Alexa registration number with my Google registration number just to be on the safe side. Either way should be alright though. Not a problem, happy I could help. Hi Shiv, under tools->Available tools you should see a section called Webmaster Tools Verification that has two text entry areas. These should be titled Google Webmaster Tools, and Bing Webmaster Center. This section should show directly under where you see the “Press This” button that you mentioned seeing. The Press This button is only there so that you can move it to your browser’s toolbar and then use it as a bookmarking tool as you are browsing the Web. If you can’t see the Webmaster Tools Verification section below the “Press This” button section then I’d suggest first trying a different Web browser. If trying a different browser still doesn’t work, you should contact WordPress support since this might be an issue they can help out with. I have the same issue. It’s probably because you (like me) are self-hosted. The only option Alexa recommends for those of us with self-hosted wordpress sites is a plugin which is apparently out-dated. It does not work with the most recent wordpress update. You just saved me! I was so lost thanks a million! I’m happy you found the article helpful, thanks for your feedback! Thank you so much!!! I was going nuts trying to figure it out but this worked and only took about 3 seconds! Thanks for your feedback, I’m glad this article was helpful to you! Hi, thanks for your feedback, I’m glad you found the post about registering a WordPress blog with Alexa interesting! hi thanks for the tutorial..nice one!! already verify my site in alexa .. thank you..
Hi, I’m glad the tutorial was useful to you and that you got your site in Alexa! Cheers! So true, it’s tough going to rank well these days. I wish I knew some tricks, but I don’t think there is any easy way to rank well. As far as I know consistency of posting, age of site, and quality content are important for most engines. I’m not sure how important incoming links are these days although they used to be of some value. Great point about using social bookmarking. I’ve started using Bitly and Diigo for bookmarking, which I’ve been finding to work nicely so far. Seems that incoming links are only important if you have a good number of relative sites (well ranked themselves) linking in on you. The best way to get Alexa ratings is to constantly put out lots of content. If the quality is good then you will increase eyeballs on your site and that makes the Alexa number lower and lower. Keeping your front page and other pages updates seems to help also. Consistency alone is not good enough. Example if you constantly put out a story per month, then you would probably have very high Alexa numbers, but if you put out one story per day you have a better chance of getting better SEO and thus more eyeballs. Thanks, this is great advice with some very good points. Bottom line seems to be that it takes a lot of time and hard work to rank well and there are no magic shortcuts. I appreciate the guidance given in your article! Excellent!! It worked for me in “Google Webmaster Tools”! Thanks for your feedback, I’m glad the article was useful for you. Thanks for your feedback, I’m glad the article was useful to you! Thank you Justin. it worked for my site at http://ozwdsau.wordpress.com. Thanks for your feedback, I’m glad the article was useful to you.